Sense to Solve constantly researches trends and subscribes to various future trend reports to ensure that we stay ahead of the curve. 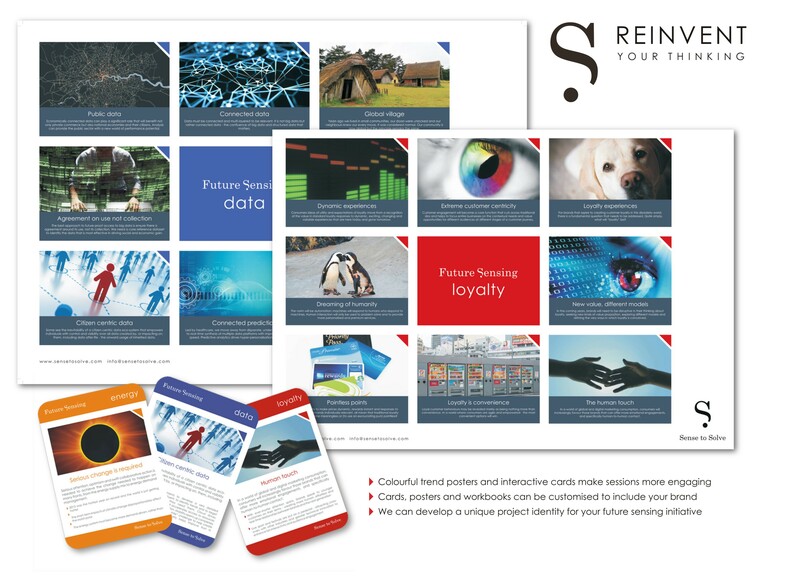 Our Future Sensing solutions apply Futures Thinking to help your organisation to imagine and then analyse different possible, probable and plausible futures. We work with your team to create various scenarios, which enable exploration around the possible impact of external events and internal decisions on your organisation. We also use visioning to assist you in establishing goals for the future and then provide you with tools you can use to help you to reach your goals and realise your vision. Using colourful posters and trend cards we encourage teams to shop for ideas across more than 20 different future trend categories. In this way our Future Sensing process is designed to spark fresh ideas and will get your team thinking and innovating with renewed creative energy. Lego Serious Play works as a powerful addition to this process as it enables delegates to physically construct future scenarios. These are 90-120 min in duration and can be either boardroom or seminar style. They can either be based on a general overview that includes key trends from a macro perspective (technology, environment, money, etc.) or we can focus on a specific industry trend like healthcare, entertainment and farming among others. We can run half day or full day workshops and can design sessions that take place over 2-3 days. Future Sensing workshops are often linked to innovation strategy and it makes for a highly engaging session when participants are able to work on one or more real challenges. This is when Future Sensing is built into a much bigger innovation drive that is fully integrated within the organisation and rolls out over a year or even longer.